The original method and book was published in 1981, quite a few years ago. The current version of that original book and method, was published in 2005 by the original publisher Rodale Press. Since then, we’ve made many improvements in the system and those improvements are all in the 2007 ALL NEW SFG book by a different publisher. However, many people still like to read that original SFG book for all the stories, charts and history in it. One of those major changes in the original system was how once you determine a location, then you dig down in the existing ground and remove six inches of soil, put that into a wheelbarrow or tarp, and then add two inches each of peat moss, coarse vermiculite, and blended compost. Mix it up and pour it back into the hole you just dug. Of course, now you have 12 inches deep of improved soil, so you have to build a six inch deep box. Does all that make sense? Well, that was the original method and book, but as I went around the country giving lectures and demonstrations, people would say, it’s really a great system and it works fine, BUT. Now as soon as I hear the word but, I have an idea of what’s going to come next. And then they say, even though it worked, and I was very happy with the results, it was still a lot of work. Then I said, wait a minute. You used to have a garden as big as this room. Now you’ve got something that isn’t any bigger than a couple of table tops. And they repeated, yeah but it was a lot of work digging up those six inches. And even though I thought they’ve reduced the size of what they have to dig up by 80 percent, they now thought digging up that remaining 20 percent was still a lot of work. So, back to the drawing board. I went to visit my favorite commercial greenhouse growers and as I walked in the end door, there on benches were boxes that measured four to six inches deep and plants growing as lush and large as you can imagine, including all the warm weather crops like peppers and eggplant and tomatoes. How do you do that, I asked? And they said, we start with a perfect soil mixture. I asked about their existing ground ouutside, and they said, you don’t think we dig up our existing ground, do you? That’s dumb. That soil’s no good, filled with weed seeds, and would require a lot of fertilizer to make it work. It’s cheaper and easier to use a blended mixture out of things like peat moss, vermiculite and compost. I said, that’s what I use now, have been for ten years in my system. Then after 2 years of experiments, it really dawned on me that if they can grow it in a greenhouse in six inches of perfect soil, why can’t we do the same thing in our garden above ground? And if you don’t have to dig up your existing soil, many magical things happen. You don’t need any tools for digging. That includes shovel, spade, fork, rake, pickax, wheelbarrow, hoe, and those are costly, heavy pieces of equipment. Why, you wouldn’t even need a toolshed if you didn’t need any tools. And you wouldn’t always be looking for your hoe you left somewhere, or your spade. That’s a really big number 1. You won’t have to study, test and learn anything at all about your existing soil. You won’t care if it’s sandy or silty. You won’t care what its existing nutrient content is, and you won’t even have to learn what the pH is of the existing soil. You won’t have to test for its solubility, nor its drainage factor. In fact, you won’t have to learn one darn thing that people now spend hours and hours trying to learn when they use the antiquated and inefficient single row system or even the wide bed or any of the raised bed systems. 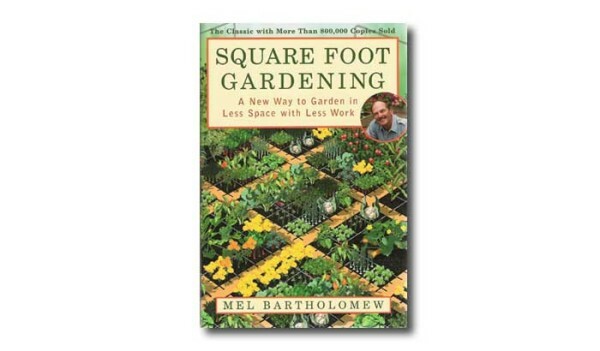 Square foot gardening is the only system where you don’t have to use any of your existing soil or bring in something like topsoil or what the nursery will sell you as a whole truckload for only $10 type of soil, but every one of those are filled with weed seeds and questionable nutrients. Since we use a blended compost soil mix, we don’t have to wait for the composting process to work over the first couple of years. Our compost is all finished and ready for plant growing. Are you still with me? Just one more, although there are many other advantages to this SF system. Because of the spacing of either 1, 4, 9 or 16 plants per square foot that I laid out, and the fact that we only need 20 percent of the space compared to all the other methods, your garden can be located as close to the house as possible. That means easier, quicker, and better caretaking, especially if you can see your SFG out your kitchen window. That’s my favorite spot. Then you can continue to admire it throughout the day, notice if there are any problems going on, like a rabbit or a neighbor’s dog or cat, and it’s also so convenient for harvesting that you’ll eat more from it, loose more weight, trim off those inches where you don’t want them, and eat healthier. I’ve even had families tell me the kids love gardening so much and are so excited about their own boxes that sometimes they just go to their garden and have supper outdoors, picking right out of the garden. That’s especially fun if you have the sugar snap peas, bush beans, and little cherry tomatoes. If you don’t grab a copy of this book, you are doing yourself a tremendous disservice. Shorten your growth curve and just buy the book. You won’t regret it. It works! So based on the many testimonials we still keep getting, I’m thinking that if you want to read the original SFG book and you promise that you have the ALL NEW SFG book, because I want you to have the latest major ten improvements, I would be willing to send you that original book either all by itself or added to any order you’re going to make for just a $5 donation to the SFG Foundation. This offer will end Dec 31, 2011 so do it now. It retails for $19.99 and is featured on Amazon for about $7-$8 and none of that money goes to our Foundation, it only goes to Amazon. So do yourself and us a favor and order this 2005 version of the original SFG book for a donation to SFGF. I sure need to get me the new book. I have the original one and it has been wonderful to use but by reading your post I realize why I dug my beds down and mixed soil with the compost, peat and vermiculite when I went back to square foot gardening 3-4 years ago. That’s what we used to do! I do get weed seeds but I am able to use my finger and thumb and pull them right out. No weeds would be best but I am so happy not walking through muddy trenches pulling out huge weeds, getting pollen all over me from walking in-between the rows. My garden soil had been improved for over 15 years so by adding compost, peat, aged manure and vermiculite, my soil is light and fluffy. I plan on adding two new beds to my garden area so now I know I don’t have to dig down, woo hoo! What a great lesson in learning about improvements and following them. Since over a million of the original books were sold, I wonder how many of those people are still digging up their existing soil, requiring all those tools and all that work? I wish we had a list of them so we could send them an announcement of the new book! How did YOU hear about the new book and what prompted you to change to the new improvements. Isn’t it wonderful to have no weeds? Think of how many gardens have been abandoned throughout the years due to weeds? that could really be the most important reason to start a Square Foot Garden. Thanks for your letter and I hope a lot of people read this and are influenced by your words and experiences.